KALAMAZOO, Mich. – Habitat for Humanity’s 205th homeowner family will dedicate their new home on June 10th 2018. More than 250 Habitat for Humanity volunteers contributed time and talent to this project, working beside the future homeowner family. The house was built by Education for Employment (EFE) students during the 2017-18 school year as part of the EFE Construction Trades program. Volunteers included Habitat’s regular Tuesday, Wednesday, and Thursday crews, and groups from WMU: Beta Alpha Psi, Lee Honors College, Pi Kappa Phi, FOCUS, Consumers Credit Union, Valley Family Church, MDOT Youth Program, Abraxas, Eaton, Digital Marketing and Stryker. The modest two-bedroom home was built using advanced construction techniques, added insulation, upgraded windows, and ultra-efficient appliances. This creates a comfortable, healthy, durable home for the family that is affordable to maintain and operate. The estimated energy costs are only about $700 per year. While there is a small increase in cost to build to these efficiency standards, the family can expect to save at least $25,000 in energy costs over the next 30 years. A no-step entry, wider doors and hallways, and a larger bath were also installed that can accommodate those with disabilities visiting or living in the home. 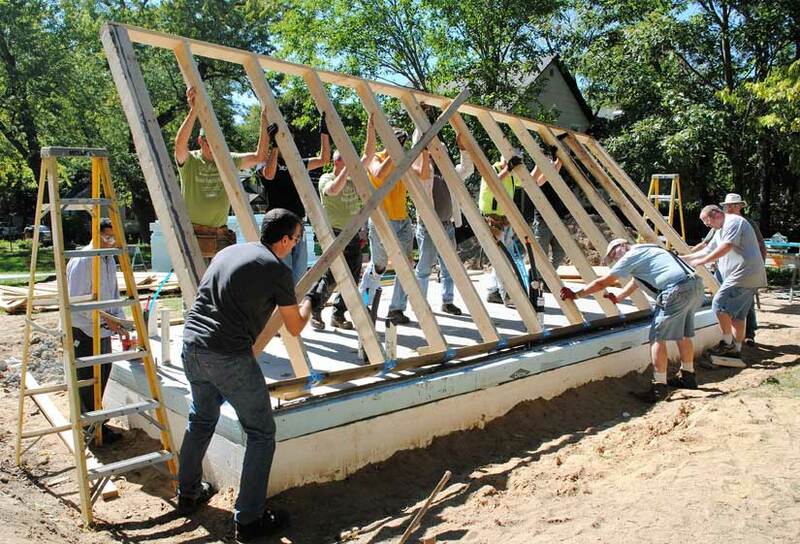 The house will be purchased by a qualified Habitat home buyer who has contributed more than 300 volunteer “sweat equity” hours to help build this home and the homes of fellow Kalamazoo Valley Habitat for Humanity homeowners. Habitat for Humanity makes no profit on the sales of its homes and provides a very affordable mortgage. The future homeowner also completed more than 30 hours of MSHDA-approved financial literacy and personal financial management classes at Kalamazoo Neighborhood Housing Services. They also completed more than 27 hours of homeowner maintenance training provided by Community Homework’s in partnership with Habitat for Humanity.